I’m writing a book about Christmas since 1914 so I’ve been watching a lot of Christmas specials from the 1970s and 80s recently. Television has been rather underused as a source by contemporary historians because old programmes have always been difficult to get hold of. However, the growth of people using Youtube to share things they buy on DVD or find on old VHS tapes (and television companies’ apparent willingness to overlook the copyright infringement) mean there is now online a wealth of ephemera from the small screen. Just as with novels, the historical riches come not from the highbrow but from the popular. The light entertainment of the past is an important source because it says so much about what people found funny and their everyday attitudes. It also reminds us just how much these attitudes have changed. The 1970s and 80s doesn’t seem that long ago but watching its television shows is a reminder of a world where sexism and racism were rife; pretty girls were there to be openly leered at and jokes about buses being like Calcutta were funny. Humour is a complex phenomenon to study. Just because a script writer thought a joke was worth telling and a studio audience subsequently laughed doesn’t mean the audience at home reacted that way. Nor should we just accept viewing figures as measures of which shows reflected popular tastes. In a world of three channels, there wasn’t exactly much choice and many a person found themselves forced to watch something at Christmas to compromise or to keep the peace. Then there’s the issue of how we escape our own tastes and, in the case of recent television, our own memories. I did not find a 1970s Tommy Cooper Christmas special remotely funny. But was that me or was it always very silly? In contrast, the Good Life and the Two Ronnies have held up well and made me laugh. But then they did in the 80s too. In contrast, as a kid I never liked repeats of Steptoe and Son. It’s still not very funny but it’s been far the most interesting watch in my research because it’s full of sociological comment. Yet interpreting that is not easy. When Albert sings ‘Enoch’s dreaming of a white Christmas, just like the ones he used to know’, are people laughing at or with Powell’s racism? In a society where race was a divisive issue, it was probably both. Alas, I’m not sure that I’ve learnt too much about Christmas itself from these programmes but they were an integral part of the Christmas experience for the majority of the population. The research is thus probably more about getting into the mentality of the past rather than about finding out specifics, even if that does mean I need to try to lose the traces of that mentality that still exist in my memory. If nothing else, I’m learning why light entertainment was so important on Christmas day. At its best, it was very funny but it also enabled people to escape the kind of domestic quarrels that they were watching depicted on screen. 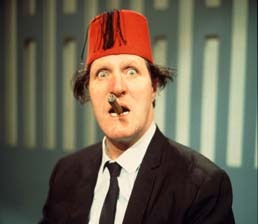 And in some families that was probably worth putting up with a bit of Tommy Cooper.